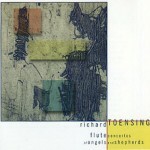 The works on this recording by Richard Toensing are of the highest order for both the wind ensemble and the soloists. 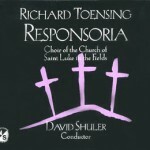 Toensing’s muse is an ambitious and generous one, requiring extreme competence of musicianship, mastery of varieties of style and great sensitivity. He shows himself to be a master of all the sonic possibilities available to him. 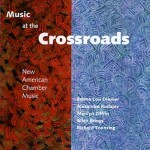 Mezzo-soprano Erica Washburn is director of choral activities at the New England Conservatory. Soprano Bethany Worrell is the soprano artist-in-residence with the Metropolitan Chorale of Brookline. 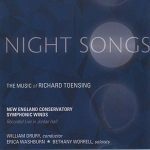 William Drury is New England Conservatory’s associate conductor of wind ensembles and the conductor of the Southern New Hampshire University Orchestra. 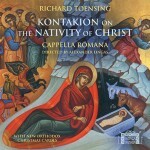 Written for two choirs and six soloists, this four-movement sacred work on the mysterious birth of Jesus, sets selected stanzas from the Nativity Kontakion of Romanos the Melodist (6th c.) Also featured are 12 New Orthodox Christmas Carols.